During processing of metallic compounds, excess materials are produced during processing in the form of dusty materials with highly variable grain size. 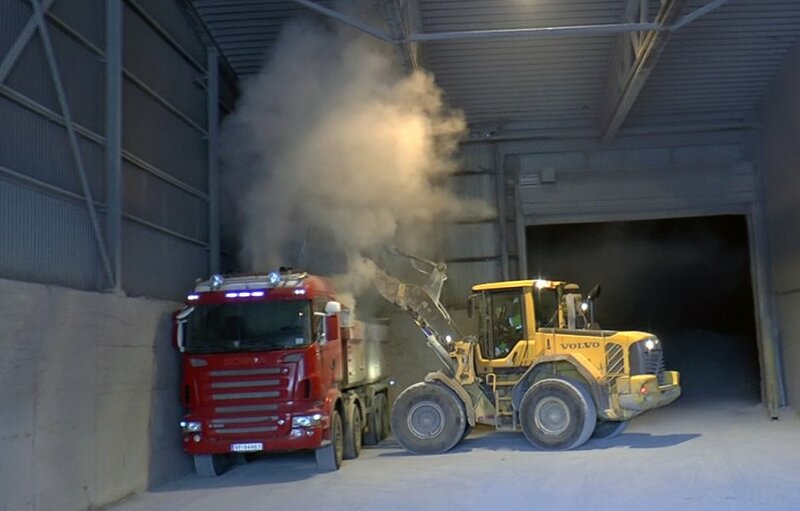 Particularly during loading by wheel loaders into open dump trucks, dispersible dust particles are produced, which can lead to heavy emissions. Within a few minutes the whole loading area is full of dust, which subsequently also spreads to adjacent areas. According to work safety requirements and pollution control laws, it is necessary to prevent this uncontrolled spreading by means of suitable process-related and ventilation measures. 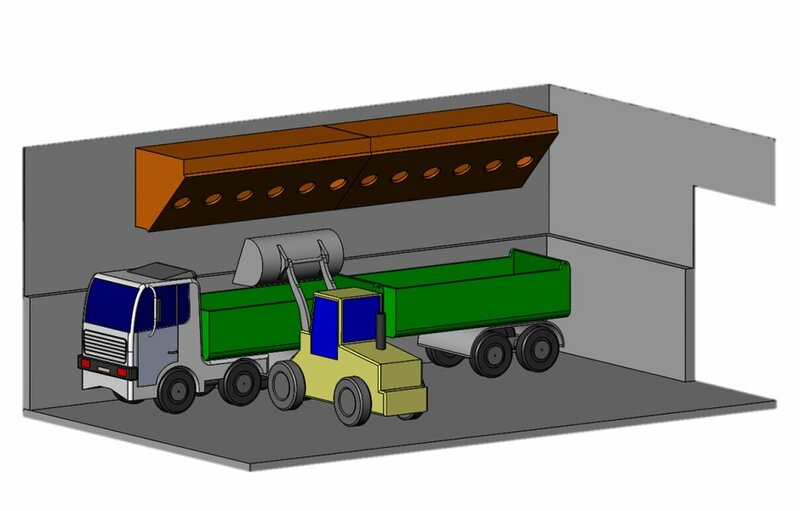 Image: Extraction of a truck loading point / Loading of dusty excess materials by means of a wheel loader on a dump truck without exhaust equipment. The industrial air technology competence center at ETS has been assigned to perform an on-site technical current-state analysis and based on this to prepare a ventilation concept to prevent pollution. With the findings from the current-state analysis they were able to determine the design of a collection element (extraction hood) and the necessary parameters. In this context, the process sequences during the loading process were analyzed and the spreading characteristics recorded by video and evaluated. Even all basic conditions influencing the emission behavior such as transverse flow effects were determined and taken into consideration. As a result, an extraction unit in the form of the ETS nozzle hood was analyzed and designed in line with the local building and the vehicles involved. The ETS nozzle hood consists of a row of flow-optimized inlet nozzles in an even panel surface, which forms a stabilized nozzle flow in its layering. In comparison with the flow characteristics of conventional box-shaped or trapezoidal overhead hoods, the highly energy-efficient ETS nozzle hood has a significantly greater intake intensity and thus lower requirement of extraction volume flow, along with stabilization of the emission volume flow influenced by transverse flows in the intake zone. The emissions released during the loading process are collected directly from the place they are generated, and then are extracted with high efficiency. Spreading of the fine dust into adjacent areas of the facility is effectively prevented, and largely dust-free loading of dusty excess material is ensured by use of the ETS nozzle hood. 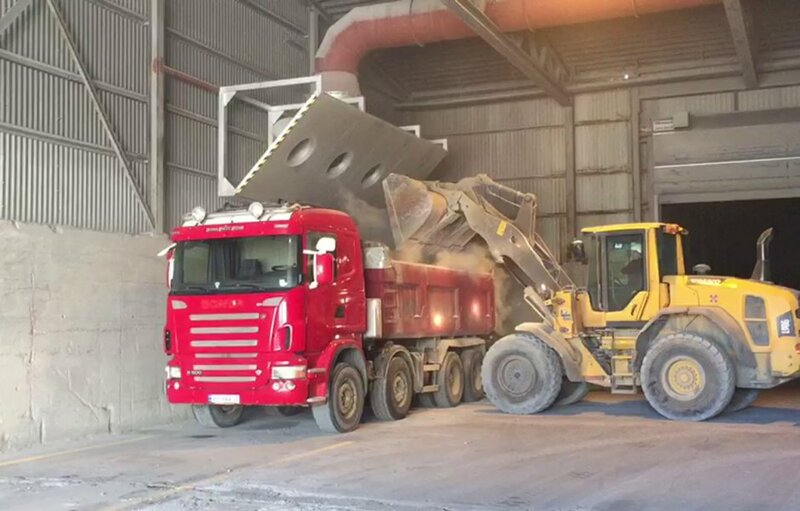 Loading of dusty excess materials by means of a wheel loader onto a dump truck. No emission formation due to efficient extraction by means of the ETS nozzle hood.